I’ve been looking forward to hearing about this run ever since I saw Paul and Patrick had it planned on facebook. 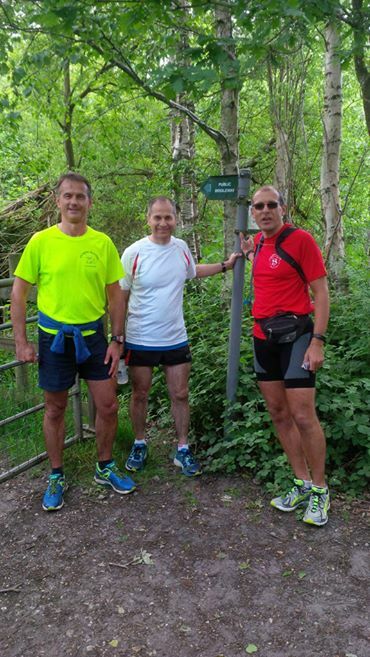 Here is Patrick’s report from the Ramblers Route! A jolly good read on a Friday afternoon – so grab yourself a cuppa and get stuck in! (Huge thank you to Patrick for taking the time to put this together). At 26 miles according to the leaflet it seemed too good to miss. Paul B, Newton and I ran it on 9 June taking advantage of the midsummer daylight. We set off at 5pm with at least 4.5 hours until the sun set carrying enough water and food for the run we hoped. The route is waymarked in most places but in places the signs appear to have gone. We also had a gps with a track on it but there were a couple of places where the route leaflet and the gps track differed. The gps was an advantage as it allows ‘at a glance’ confirmation that we were on the right track. We started at South Road as it was the closest point for Paul and me. The route sets off towards Wildmoor Bottom, across the Crowthorne Road and alongside the railway to Crowthorne Station, all familiar to SJs. Across the East Berkshire Golf course bathed in sunshine and passed Ravenswood village and a lovely hidden path along the main road and we appeared at Honey Hill and the Crooked Billet. A short road run then off-road again through Easthampstead Park and we were suddenly at Jennetts Park (where we made a small navigational error due to the new estate). A bit industrial as we skirted Amen Corner and the dry ski slope then round Popes Pond in Binfield. Then some great running through fields with splendid views, apart from the bit by the sewage works, to Warfield Church. It was just after here that the gps and route description varied the most with the description taking a shorter, direct route along a road rather than the longer route through some woods. We took the road. On we went, using a byway, to North Ascot where we found an open convenience store and raided it for more water and sweets. The miles were starting to kick in and the banter was getting more infrequent when we popped out on London Road and realised that this was the London Road between the Mercedes garage and Heatherwood hospital which meant that we were nearly at the Look Out. A great path through the Englemere Nature reserve and across the railway into Swinley and another run on aforest path parallel to a very busy road and we arrived at the Coral Reef Roundabout. We felt we were nearly home, running on familiar paths back to Upper Star Post, Devils Highway and Broadmoor Farm to finish back on South Road. We made it just over 25 miles but by the time I had run home I had 26.25 on the Garmin. It took little longer than we had expected but Newton set a personal distance record by the end. An evening well spent. All the paths had good surfaces and the route finding was pretty simple using the leaflet. It was interesting to come across familiar places that seem to take a long drive by car but only a short distance to run. There is very little road running with lots of diving through hedges onto hidden paths. There are a few places where some care is needed with navigation but not many. Wildlife seen: Muntjac deer, Roe deer, peacocks and hens, Shetland ponies, horses, rabbits, goats, squirrels, Red kites, wood pigeons and some archers. Have you been on an interesting run recently that you think others will enjoy? Send me a ‘running route’ review and we’ll get it on the blog. Sharing is caring!